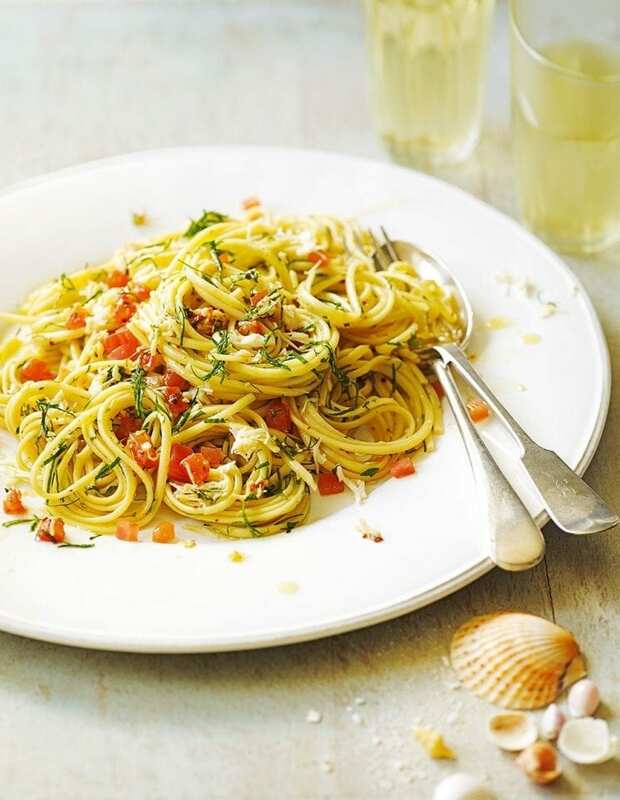 Rick Stein’s quick pasta recipe combines sweet crab meat with fresh tomatoes, parsley, lemon juice, garlic and a spicy kick of chilli flakes. Cook the pasta in a large pan of boiling, well salted water (around 1 tsp per 600ml) for 7-8 minutes or until al dente. Meanwhile, put the chopped tomatoes, crabmeat, parsley, lemon juice, olive oil, chilli flakes and garlic into another pan and warm through over a gentle heat. Drain the pasta, return to the pan with the warmed sauce ingredients, then briefly toss together. Season to taste. Divide among 4 warmed plates and serve immediately. To skin the tomatoes cut a small X in their bases, put in a heatproof bowl, then pour over freshly boiled water and leave for 1 minute. Drain and refresh under cold running water for a minute or so, then carefully pull off the skins – they should come away fairly easily. Our friends at Majestic Wine recommend Domaine du Vaux St George. This sophisticated Sauvignon Blanc is from Touraine in the Loire Valley. Light and bright, with elderflower and tropical fruit notes, it’ll refresh after a mouthful of this spiced crab linguine.